Male puku are larger than females, and mature males have especially thick, muscular necks. The coarse coat is golden brown with pale underparts. The puku lacks distinctive markings on the face or legs, although there is an indistinct whitish ring around each eye. Territorial males annoint the base of their necks with secretions from the preorbital glands (located just in front of their eyes), resulting in a greasy darkened patch (most noticeable between May and November). The backs of the ears are golden, and the ear tips are black. 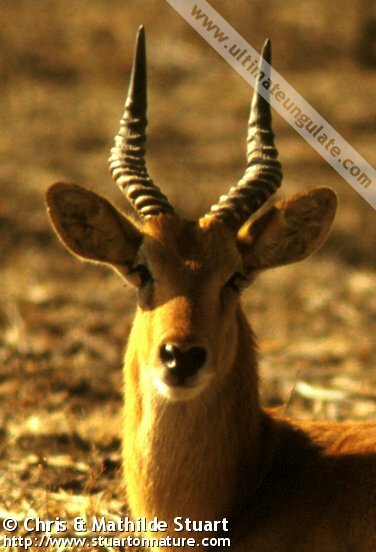 Only males grow horns, which are much shorter and stouter than those of the related kob (Kobus kob); in profile, they scoop upward shortly after arising from the skull. The bases of the horns are heavily ringed. Average horn length is around 40 cm, although lengths of up to 52.7 cm are known. 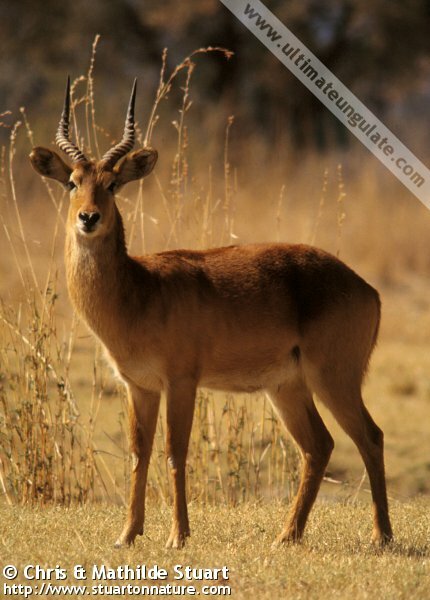 Puku and kob (Kobus kob) are closely related, but are readily distinguished by the puku's smaller size, stouter horns, and unmarked legs (kob have black lines along the front surface of the front legs). Weaning: Believed to be around 6 months (if similar to kob). Sexual maturity: Presumably after 13 months (if similar to kob). Life span: Up to 18 years (if similar to kob). 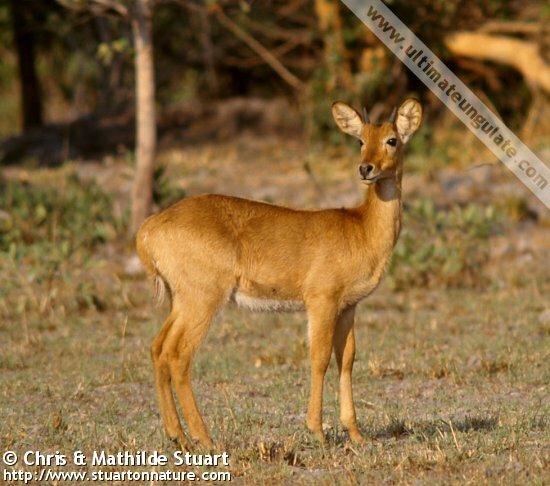 Puku breed year-round, but there is a peak in births between January and April in Zambia (extending to June in Botswana); this coincides with the wet season. Infants "tuck up" for several weeks in tall grass and are visited by their mothers for nursing, most often in the early morning. After this hiding period, the young do not display a strong following instinct, and if startled will often flee in a different direction than their mothers. Young males will typically leave their natal herd before one year of age, while females will stay loosely associated with their mothers until adulthood. Puku are most active around dawn and dusk and may continue to feed into the night. Males are territorial year-round, and advertise their ownership by whistling repeatedly (2-4 times) every thirty minutes or so. Ritualized displays are used to defend teritorial boundaries and actual fights appear to be rare, although males with broken horns indicate that fights may be severe when they do occur. In preferred floodplain habitat, male territories tend to be smaller (around 5 hectares) and more tightly packed than in woodland habitat (where typical territory size is 15 hectares). Females inhabit larger home ranges (averaging 24-34 hectares) that overlap multiple male territories; female groups are attended closely by territorial males, but freely cross territorial boundaries without the resident male attempting to herd them back. 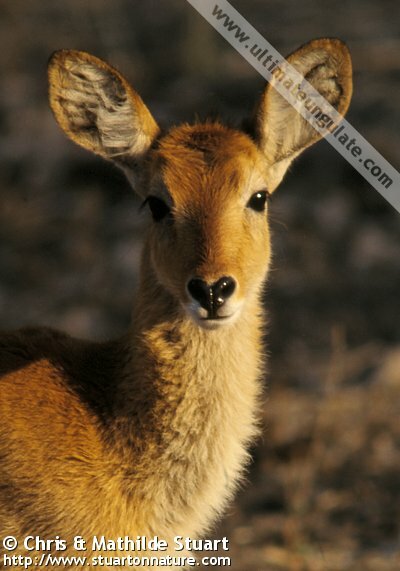 The alarm call is a single sharp nasal whistle; if disturbed, puku typically flee for a short distance, then will stop and reassess the threat. Family group: Females and their young live in loose groups of 6-20 (up to 46) individuals. Males are often solitary, but younger males may live in bachelor herds of up to 15 (rarely to 25) individuals. Diet: Grasses (especially perennials), some forbs. 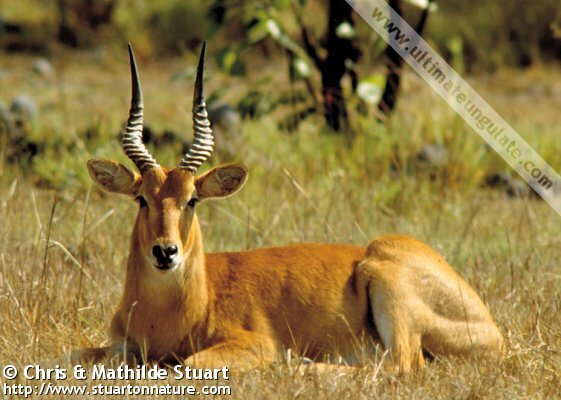 Puku inhabit floodplains and adjacent grasslands and shrublands in south-central Africa. They avoid deeply flooded areas, and move to higher ground (often woodland habitat) when seasonal flooding inundates their preferred floodplains. The approximate range is depicted in the map below. IUCN Red List: Near Threatened (2016). Threats: Hunting and habitat loss, especially due to competition with livestock and by conversion of shrubland habitat to farmland. Puku appear to be sensitive to disturbance, and are currently restricted to isolated pocketed of floodplain habitat. The estimated total population is approximately 130,000 animals, scattered in a number of isolated areas. The Kilombero Valley in Tanzania holds the largest subpopulation, but numbers there have been declining in recent decades.